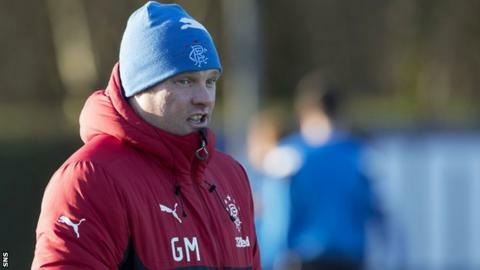 Interim Rangers manager Graeme Murty has again suggested he would like the job permanently. Murty has been installed as favourite for the Ibrox vacancy in the wake of Derek McInnes' decision to stay at Aberdeen, but he remains sceptical about his chances. "It would be extremely difficult to turn down but that's not on the table as far I understand it," Murty said. "I'm happy with that. I'm happy to do the job as best I can in the interim." Murty, who took charge following the sacking of Pedro Caixinha, has won four and lost two of the matches he has overseen, including back-to-back wins over Aberdeen that have lifted his side ahead of the Dons into second place in the Premiership on goal difference. Rangers have confirmed he will be in charge until at least the end of the year after McInnes' decision. "I'll just crack on and do my job," he added. "It's for other people to decide the level I'm capable of operating at. "Do I see this next month as a job interview? No, I see it as six games to put the club in a good situation. "If an outstanding candidate makes itself available tomorrow and the board decides to go in a different direction, I'll be beholden to them and go and do exactly as they see fit."